Go to Boot tab using arrow keys and see there is a option to save the changes. Topic reopened at @gakuenalice's request. Have you tried to save the changes from Exit tab? If the computer cannot start in Safe Mode (f8), it may be possible to start the Windows Recovery Console and then run the CHKDSK /R command to clear the initial Unmountable_Boot_Volume error. 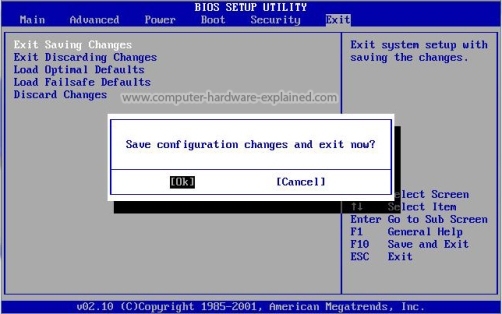 The following steps explain how to access a command window using the Recovery Console. Once you open the command window in Windows XP, the instructions for using the check disc (CHKDSK /R) command are the same. 1. Insert the HP Operating System disc, or a retail version of the OS disc, into the CD or DVD drive, and press the Power button to start the computer. 2. When prompted, press any key to boot from the CD or DVD. 3. A blue screen will appear and several files will load. This loading process may take a minute or more to complete. 4. When the setup menu displays on the blue screen, press R to select the "Repair a Windows XP installation" option. Selecting this option opens a command window. 5. At the C:\ prompt, enter CHKDSK /R, and press the enter key. This repair process may take 30 - 60 minutes depending on the size of the hard drive and repairs needed. 6. After the CHKDSK command displays the results of its actions, enter exit at the C: prompt and press the enter key. 7. Windows will restart. Eject the CD or DVD and allow Windows to start up normally. If you don't have Windows XP Setup CD you can create one download the ISO image of Windows XP from below link. You can create one from the ISO image download link i have posted. i have usb flash drive i have to download iso file? Yes download the ISO image of Windows XP make sure its correct edition and use WinToFlash program to create bootable Windows XP USB flash drive. You have no choice you have to purchase Windows XP Setup CD. Can you boot Windows into Safe Mode?